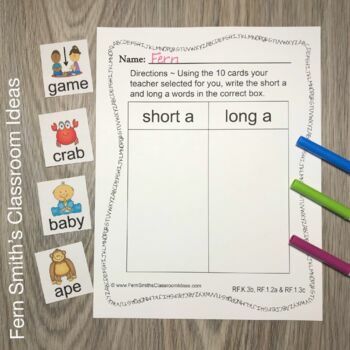 Vowels: Vowel Sorting: Vowels Covered are Short a and Long a with Center Games, Worksheets and Interactive Notebook Activities for Long a and Short a! You can get all five vowels RIGHT NOW in this Vowels: DISCOUNTED BUNDLE! There is a colorful version and a black/white version to save money on colored ink. *Send the black and white centers and worksheets home for weekly homework practice! All Common Core Listed on a page to print for Your Lesson Planning! 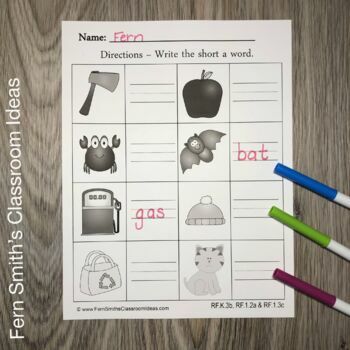 I'm Fern Smith from Fern Smith's Classroom Ideas. I've created many resources tp help students enjoy learning many basic facts. The rigor involved with Common Core is getting harder and harder for our young children to master. If they don't have a basic understanding of basic skills, we're setting them up to fail. I invite you to please visit my blog and store for many great ideas. 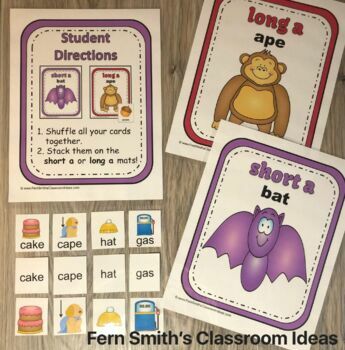 Fern Smith's Classroom Ideas! TPT Store! © 2014, Fernley Smith, All Rights Reserved. Permission is granted to original purchasers to reproduce material as designated only for ONE classroom use. No other part of this work may be reproduced in any form or by any electronic or mechanical means including information storage and retrieval systems without permission in writing from the publisher, except by someone writing a review, who may only quote brief parts in a review. Multiplication Arrays Go Fish, Old Maid and Concentration Center Games! 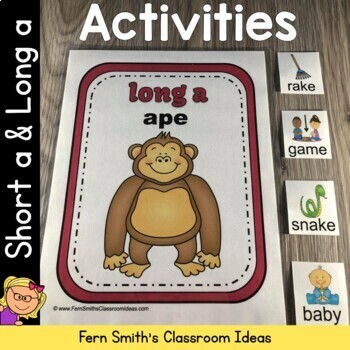 Keywords: Vowels, Short a, Long a, Word Work Stations, Literacy Centers, Daily Five, Seatwork, Phonics, Daily 5, Writing Centers, Fern Smith's Classroom Ideas. ELA-Literacy.RF.K.3b Associate the long and short sounds with the common spellings (graphemes) for the five major vowels. ELA-Literacy.RF.1.2a Distinguish long from short vowel sounds in spoken single-syllable words. ELA-Literacy.RF.1.3c Know final -e and common vowel team conventions for representing long vowel sounds.